Is your garage door not working due to a broken spring? Don't worry! 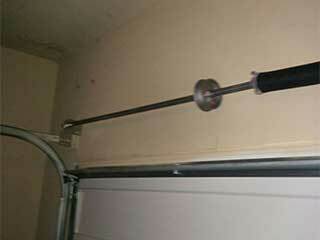 Garage door spring repair is one of our company's specialties. We can repair or replace both torsion and extension types, so when you need prompt professional service, call our experts at Garage Door Repair Hollywood. Replacing these powerful components is not something that should be attempted by a homeowner or general handyman on their own – a mistake can cause serious bodily harm. These components are under a lot of stress and require special tools in order to adjust. Our technicians have the proper training and the right equipment to safely complete your garage door spring replacement. Let's give you some general information first. There are two main types of garage door springs, torsion, and extension. Their names do suggest the methods of their action. Torsion type springs operate by twisting and unwinding in order to properly support the weight of your garage door panels. They are installed above the door, parallel to its width. The extension type springs stretch and contract in order to achieve the same goal, and they are usually installed along the ceiling of your garage, moving from the door inwards. Extension springs are the older variety, and they have come to be considered the more dangerous and less durable of the two. Since the nature of their action involves a tormenting ordeal of essentially being pulled on both ends towards different directions, it's quite obvious why they tend to break more frequently. Torsion springs, on the other hand, are considered far safer, and much more durable. Think of their action like ringing a water-drenched towel, twisting it against itself to create the necessary tension. Becuase they are stronger, they are usually the preferred choice for heavier garage doors. A broken garage door spring is no trivial matter. Since these components are under so much tension, when they finally snap, they can go whipping around your garage. These are steel coils we're talking about. Just imagine getting hit with one that's flying at you faster than an average MLB pitch. But even after the springs break, operating your garage door is still very dangerous. The panels could collapse if you try. Aside from your personal safety, other parts of your garage door could also be damaged as a result. Don't hesitate to reach out to our experts at Garage Door Repair Hollywood when you have to deal with any issue related to these dangerous components. We'll perform any necessary spring adjustment or replacement safely and quickly. Call us today.